Students have an opportunity to create anonymous love letters in the Santos Manuel Student Union (SMSU). 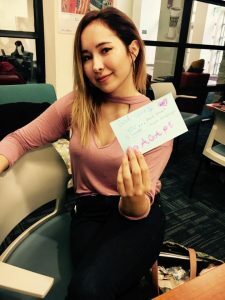 The Osher Adult Re-Entry Center (OARC) started collecting letters from students on Jan. 23rd and are to be dispersed all over the campus after Valentine’s Day. 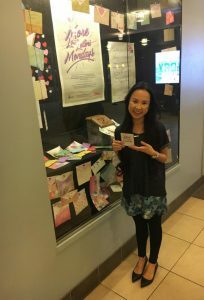 “There are two ways you can get involved with the Love Letters campaign,” said OARC employee Asia La Pham. The first way is you can nominate someone, either a student or faculty employer at CSUSB, who could use an extra dose of encouragement. The love letters will be scattered across campus locations; ranging from classrooms to even rented out library rooms. So far, the OARC has received more than 40 letters but there are only two weeks left. “We have a cute stationary, pens and papers. You’ll just basically write positive messages and what we do throughout the week is take the bundles of letters and we hide them around campus,” added Pham. Student Bethany Wattimena discussed her thoughts to me in a simple question. “Why not make a love letter?” asked Wattimena. When one visits the OARC, it offers an opportunity to finally create a positive impact in someone’s life through a loving act of kindness. “Everyone in the world, at some point in their life, goes through something tough. There is really no escaping it—so it’s just to let people know there’s someone giving them a positive thought to remember that they have a choice in how they go about that situation,” said student Donnie Edison. “Compassion and empathy […] People I don’t think often enough put themselves in another person’s shoes, you know instead of wondering how they are getting through what they’re going through, they’re just condemning them or they’re criticizing them,” added Edison. Alondra Muñoz, a theater student, expressed what she believes to be her idea of love. “Love is from God, and God is love. Once you have God in your life then you have love,” said Muñoz. OARC can be a bit tricky to find so if you go to the SMSU. It is across from the Starbucks, located in a little hallway. The OARC will provide art supplies for anyone interested in crafting an anonymous love letter. Also, a love letter tree will be created on displayed in the OARC for anyone who wants more encouragement to come in and pick a love letter from the tree. Anyone is more than welcome to visit OARC throughout the week.